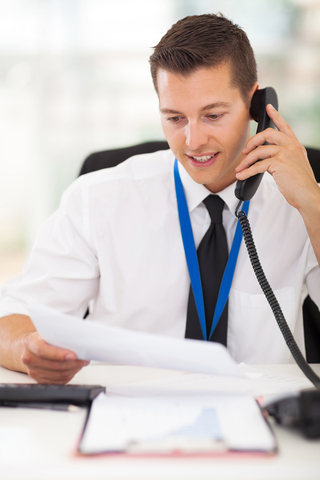 Much of the success of a collection calling campaign is having the correct contact information for the person on staff within the accounting department who will pay you. Even if you do all of the steps listed within our recently released Guide to Collection Letters correctly and timely, if you do not have the correct contact it will not be successful. While there is a possibility that the contact information for the person you have been trying to contact is correct and the late paying customer is all together trying to dodge your communications, the next step is to reach out to someone else whom you can hold responsible for the payment. Contact the main contact number for the company. There may be a possibility that the main point of contact is no longer working for the company or forgot to put an out of office email message up. Always give the company the benefit of the doubt before venting your frustration and demanding payment on a late invoice to someone who is uninvolved. If the main point of contact has in fact been in the office, he still could be taking your collection notices seriously, but his manager, or the person who approves the payments, may be out of the office. Someone who simply is waiting for approval for payment is a much different case than someone who is just not trying to pay. If you can’t get into contact with your main point of contact, try to collect as much information from the office manager on the situation so that you can best know how to proceed. There may be a higher-up within the department or someone associated with the department that can serve as a better contact. When reaching out to a person in a position above your main point of contact, always try for someone who is one level above. Never automatically reach out to the owner, CEO, or most senior executive that you can find on the company’s website. Most likely they will not be knowledgeable of the situation and it could hurt your relationship with the company. What to do if you hit a wall…. If you get nowhere with trying to find a new contact, utilize the time you have with the office manager, or whoever answers the phone. Maybe direct communication is not the best means of communication for your point of contact because their personal secretary manages their communications. Confirm contact details with the office manager and try to set up a phone meeting with your contact. If you are granted the coveted, new contact information for the delinquent account, be diplomatic with your tone of voice. The new point of contact may not be aware of the delinquent payment. Remember, you ultimately want to get paid and, if possible, keep a good working relationship with the company. Collect all of your notes on the account. We suggest that you use our free software, Profit Maximizer, to keep all of your notes and scheduled calls about the account in one system. You do not want to be caught off guard and searching for answers to questions. Keep the conversation about getting paid. Whether your original point of contact was not doing his or her job is not your business. Make sure your call is professional. This will allow the boss the opportunity to solve the problem instead of becoming defensive. Solution-based calls are the most successful. Don’t get stuck on the negative details of all of the time that you have spent trying to collect the past due balance. At the end of the day, you just want to get paid. Once you educate your new point of contact on the delinquent invoice, try one of these solution-based questions. Typically open-ended questions help continue the conversation. Would you like me to email you a copy of the invoice to pay off the current balance of $_____? How will you be able to pay off the current balance of $____ today? Should I call you if I don’t see a wire transfer today of $_____? Do you need the address of where to send the check to pay off the current balance of $_____? What bank will the payment be drawn on? Before getting off the call, always follow best practices for phone etiquette. Thank the new contact for their time and their diligence to correct this past due invoice. Provide the new contact with your direct contact information should they have questions or problems. Verify that the contact has all of the information that they need to pay the past due balance. Collection Voicemail: What Should You Do?